Since May, 2008 when American Airlines announced that it would be the first U.S. airline to charge for every checked bag, it's been downhill for frugal flight passengers. Now, nearly every airline in the U.S. and Canada charges around $25 for the first bag their customers check (and more for the second and third). But don't worry! You can avoid these fees if you're a savvy flyer. In this article, I'm going to break down six cures to the checked baggage fee epidemic. If you're a frequent flyer (usually 25,000+ miles per year), you can become an elite member of your frequent flyer program and reap some pretty amazing rewards. One of them will likely be free checked bags on your flights. Other rewards include free upgrades, free food, and unlimited booze. American Airline's AAdvantage program offers one free checked bag for Gold members, two for Platinum members, and three for Executive Platinum members. One tip that works quite well is to wear all of your bulky clothes on the plane to free up space in your bag. I'm not saying that you should dress in everything you own like Joey from Friends, but you can definitely wear your jacket, jeans, and sweater on the day of your flight to lessen the load in your bags. If you're trying to avoid overweight baggage fees, then wearing your bulky items and carrying as much in your carry-on may just save you a lot of money. A 60-lb checked bag can cost you upwards of $90, so if you can put some of that weight in the cabin, you'll be keeping some money in your wallet. Sorry, guys! This list is slowly dwindling down and you now only have one option for free bags in the U.S. — Southwest Airlines. JetBlue was the only other airline that held out on baggage fees until June, 2015 when they announced that the first checked bag would be $25 for all passengers. You may cringe at the idea of spending double the price of your ticket just for some extra leg room, good service, and a fancy meal, but flying first class doesn't always have to be expensive. Delta, for example, sometimes offers seat upgrades for $90 at check-in. First class allows you a free checked bag and often offers more weight allowance. An overweight bag on Delta can cost around $90, so why not enjoy some comfort, free booze, and a free meal along the way? Definitely ask about upgrades at check-in. WestJet in Canada offers upgrades to Economy Plus Seating for between $15–$50 and it includes food, more leg room, a drink, and a free checked bag (worth $25). Definitely worth considering. If you're a frequent flyer, it's probably worth it for you to invest in lightweight luggage. 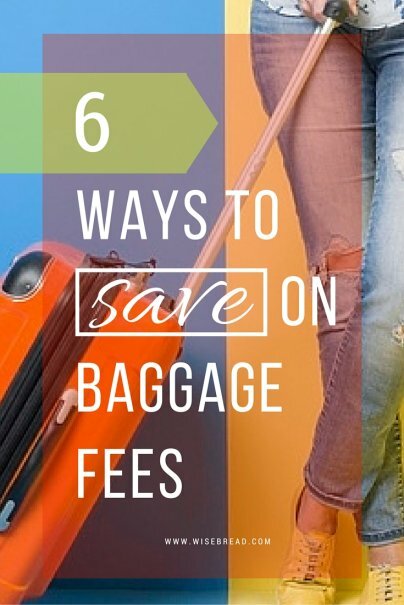 The amount of money that you can potentially save in overweight baggage fees will likely be far more than the cost of the bag over the course of a year. Some regular suitcases can weigh upwards of 20 lbs — empty! Buy purchasing ultra-lightweight luggage, you can get this down to around seven lbs. That's 13 lbs lighter, and if you're that much overweight, this luggage could save you around $60 in your return journey! How do you avoid paying airline checked baggage fees?